Have you noticed them? All those houses on the market that are listed as “fixer-uppers” or “as-is” or “needs work?” They’re everywhere. And it’s not because we’ve drained the well of adequate homes. It’s because the market is hot right now, and sellers can unload nearly any property, in any condition, and there will be a buyer willing to pay top dollar for it. A new real estate analysis shows that there are 12 percent more fixer-upper homes for sale now than there were five years ago. If you include expensive fixer-uppers priced within the top third of their markets, that figure jumps up to 35 percent. And on the opposite end of that scale, the amount of affordable fixer-uppers only increased by three percent. When you factor in the amount of buyers looking for new homes, the lack of available houses on the market, and the dim forecast of new single-family home construction for 2018, you’re left with a seller’s climate of as-is houses that will still fetch high asking prices without requiring any work from the owner. But maybe you really love that old, dilapidated Victorian in a good school district. Or perhaps you welcome the 10-year challenge of turning a small home into your own personal mansion. Or maybe you just can’t afford a $475,000 house. Whatever your reason for fancying a fixer-upper is, there are a few things you need to think about before signing on the dotted line. Most districts and municipalities have different zoning requirements, so research your prospective home’s municipality before making an offer. You may simply be required to follow certain landmarked or historic guidelines, or you could run into a big brick wall if you want to build a big brick wall. Before you sign the contract, hire a home inspector to look for any big-issue problems, like structural damage, needed foundation upgrades, or plumbing that should be replaced. This may not affect the selling price, because it’s an as-is, but it may affect your desire to still buy it. It’s also a good idea to get an estimate on future renovations by bringing in a contractor. Add the costs to renovate the property — including all materials and labor, plus an extra 5 or 10 percent for unseen extras — with the asking price, then compare that to the home’s likely market value after the renovations with real estate prices in your neighborhood. This is a good way to gauge whether or not that fixer-upper is worth it. After you’ve had the home properly inspected and compared the renovation costs with the potential value, it’s time to ask yourself if this decision is worth all of the expected work. 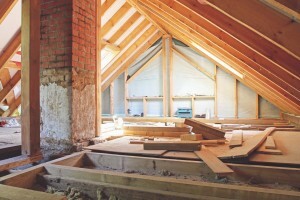 The ideal fixer-upper is one that requires mostly cosmetic improvements, such as repairs to drywall, updating the kitchen, or refinishing the floors. These improvements cost much less than major structural overhauls, but they offer huge returns in market value. Adding a new bathroom can be pretty expensive, but it’ll usually be worth twice as much as the cost needed to build it. You may want to reconsider the sale if your fixer-upper needs more TLC than you’re prepared to give. Adding on a bedroom or extending the family room may cost as much as (or more than) your return in market value. But you could offset those bigger costs by sneaking in cosmetic improvements with the structural repairs, such as modernizing your lighting when replacing your ceiling. We hope you’ve learned a thing or two about fixer-uppers. If you’re ready to start building your dream house, get in touch with us to make that dream come true. And send us pictures of your improvements on Twitter and Facebook.